It can be argued that the academic community and day-to-day practitioners in the advisory world have yet to discover a truly effective and scientific way to evaluate client risk profiles. Breakthroughs in the science of risk assessment will ultimately enable advisors to more effectively align investment solutions with clients’ pragmatic and behavioral needs. Financial risk is not the enemy—it’s a core aspect of our capital system. Accordingly, decades of academic research have been directed toward providing financial advisors with time-tested tools and techniques for reducing volatility, idiosyncratic risk, portfolio risk, benchmark-performance risk, and interest-rate risk. But while financial experts have done their part to help advisors manage the risks inherent in financial assets, the tools for adequately managing the client side of risk profiling are still woefully inadequate. University of California, Berkeley, economics professor Shachar Kariv opened his remarks at the Behavioral Finance Symposium in San Francisco last November by telling the audience that he had been fired by his financial advisor because he questioned the effectiveness of the advisor’s risk-profiling assessment. He may have exaggerated about being fired to make a point, but Dr. Kariv pulls no punches when he explains why he believes the industry gets investor risk assessment and client risk profiling so wrong. Kariv explains that there are three touchstones of financial decision-making: goals, constraints, and preferences. He then uses the example of a personal trainer to illustrate. Your goal might be something like losing 20 pounds, so you seek out a trainer. The trainer is a physical science expert and can easily design an exercise program for you that will address your goal. But to be successful at the task, the trainer must also deal with your constraints, like rarely being able to get out of your office and to the gym, and your preferences, mainly that you don’t enjoy exercising and there are certain types of exercise you would never do under any circumstances. So, your trainer, who is quite knowledgeable about the right type of exercises and how to use them for optimal results, is stymied because his challenge has little to do with that and everything to do with your behavioral issues. In the financial scenario, your constraints are relatively easy to determine. They are data-driven variables such as your net worth, how much you earn, how much you spend, etc. But your goals and your preferences represent a complex mix of behavioral issues. Goals, for example, typically involve a continuous tug-of-war between financial and personal desires. Investment preferences are riddled with behavioral biases, such as loss aversion, ambiguity aversion, availability bias, home bias, fear of regret, and a host of others. 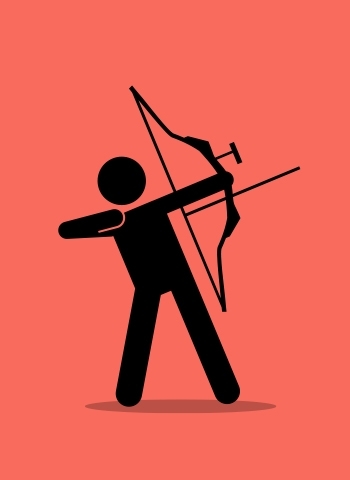 Both your goals and preferences are further complicated by your view of time, which is defined by your level of patience with money and your orientation on now-versus-later trade-offs. Our goals and preferences are also context-dependent; widely variant by gender, age, and cultural background; and likely to change over time or with recent circumstances. Consequently, Kariv says, “Asking people to assess their own risk tolerance is like asking them how many white blood cells they have. They simply can’t quantify it.” Even if they could quantify it in crude terms such as on a scale of 1–10, everyone’s scale would have different parameters and one person’s 8 might be the same as another person’s 2. Beyond these behavioral complexities, Kariv claims that people simply can’t be expected to articulate their own risk tolerance or sensitivities. “It would be like asking people to tell you how they ride a bicycle. People cannot articulate such things easily. They would tell you they can’t easily explain it, but they could offer to show you.” Psychologists know this to be true for many things. Our brains develop capabilities to do things like catch a fly ball, play a musical instrument, or drive a car. Once learned (after a lengthy and repetitive process), our subconscious minds are trained to perform that act for us. But if we were asked to explain that process verbally, we would flounder. One study on the subject solicited expert typists—the kind of people that type for a living and rarely need to look at the keys while typing. The study gave the typists a blank sheet of paper and asked them to identify all of the letters as they appear on their keyboards. Piece of cake, right? Most couldn’t do it, at least not without an arduous process of reverse engineering. Our subliminal minds deal with things that our conscious minds have difficulty explaining. Taking risks is one of those things. One of the reasons why we cannot accurately articulate our sensitivity to risk is explained in the book “Thinking Fast and Slow” by Nobel Prize–winning psychologist Daniel Kahneman. Kahneman condenses the complex cognitive process of decision-making into two types of thinking: fast thinking (referred to as “system one”) and slow thinking (“system two”). He then explains how system-one and system-two decisions are handled by entirely separate mechanisms. System-two responses are those we can take at least a moment or two to think about, such as a test or interview question. Thoughtful responses such as these are handled primarily by the neocortex or reasoning center of the brain. Faced, however, with questions that require an immediate decision, we shift subconsciously to a different part of the brain. Fast or instinctive responses (system one) are handled by the inner core of our brains, in areas such as the limbic system, where emotions and biases help us render much quicker answers. The problem is that the two areas of the brain don’t always return the same answers. Another problem is the confusion between risk, loss, and ambiguity, and the associated assumption that all three are essentially the same thing. In simple terms, risk involves returns that could stray from expectation; loss involves recognizing or locking in a loss; and ambiguity is not having a clear picture about future scenarios. All three are associated with behavioral aversions, but in fact, they can differ considerably from one another. Kariv believes that people who shy away from stocks, for example, are exhibiting an aversion to ambiguity more so than to risk. In an experiment he conducted at a boutique investment firm, he showed that among the firm’s senior executives, there were stark differences in how they measured up on these three parameters. You might think that someone who takes a lot of risk is somewhat immune to taking losses. Kariv found it is possible, however, for someone to be highly tolerant of risk while also being very averse to loss. It is very helpful to know when a client is one of these outliers. See Related Article: Do behavioral biases also affect financial advisors? Imagine asking someone in a conversational setting whether they would be comfortable risking their own safety to rescue a person from a burning building. You can analyze that question in a relaxed state; consider all of the ramifications, risks, and rationales; and come up with a reasoned response for what you think you would do. But if faced with such a situation, your brain would instantly short-cut all that analysis and dispense an immediate, emotion-driven, system-one response—one you cannot possibly replicate in the conversational setting. This is why flight simulators are so important in determining how pilots would react in a stressful situation. Would you rather have a pilot who was asked about how they would react to an engine failure or one that was tested in such a situation? Dr. Kariv refers to this phenomenon as the difference between stated preferences and revealed preferences, and he feels that it is the central issue behind the financial industry’s inadequacies in risk profiling. Kariv states unequivocally that “the financial risk survey has no scientific basis whatsoever. Why? Because there is no mathematical theory for survey design.” We could debate ad nauseam what questions to ask, what order to put them in, and what responses are acceptable in client risk profiling. But without a mathematical process underneath it, we cannot prove that we have acquired sufficient information, nor can we assign any degree of confidence to the resulting data. Furthermore, we cannot match the responses to the specific risks inherent to the client’s portfolio. If not a survey, then what? Dr. Kariv suggests that to measure risk tolerance more scientifically, the industry must move from a stated response to a revealed response, as in the flight simulator. In the financial world, that would probably look like some sort of game. Kariv takes that opportunity to remind us that much of the science behind today’s financial theories emerged from the work of von Neumann and Morgenstern in their 1944 book “Theory of Games and Economic Behavior,” and that an effective game for determining risk and ambiguity preferences can be designed and implemented on proven mathematical principles. That doesn’t mean clients would be asked to play a complex video game with warring armies. Something as simple as a preference triangle can be used to simulate an indifference curve upon which we could measure the risk someone is willing to take with a portfolio. In fact, such an experiment was conducted by the USC Center for Economic and Social Research as part of its ongoing Understanding America Study (UAS), and with very successful results. Kariv uses a similar technique in a tool he developed for TrueProfile, a new entry in the client-risk-profiling space. A sample of what a TrueProfile screen looks like is shown in Figure 1. Users are presented with an array of different scenarios and respond to each by sliding their cursor along a horizontal scale between no risk and maximum risk. 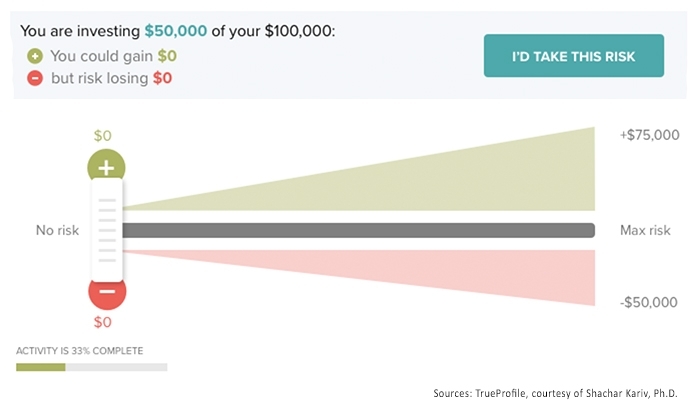 From the user’s responses to this simple decision “game,” a risk profile with mathematically proven science behind it can be revealed to both a client and their financial advisor. What can financial advisors do? Having more in-depth conversations with clients about risk preferences rather than relying on a few simple self-assessing survey questions. This should include discussing (and quantifying) various what-if scenarios that help identify the client’s tolerance to risk, loss, and ambiguity. Framing the discussion by starting with the extremes of zero tolerance and infinite tolerance so that clients can establish a more meaningful point in the middle that describes their own level of risk tolerance. Tapping in more regularly to changes in the client’s risk profile. That might mean a reality check on risk tolerance whenever a portfolio review is conducted or the client’s life circumstances change. If you do use a survey, use one that has been professionally designed rather than scratch one out yourself. Companies such as Riskalyze, FinaMetrica, and several others have received attention in the financial press and among advisors for their work on improving the methodology for conducting client risk assessments. It would make sense to check out some of the new tools available. Richard Lehman is an adjunct professor of behavioral finance at UC Berkeley Extension and at Golden Gate University. He also teaches alternative investments at Hult Business School. He has more than 30 years of experience in financial services, working for major Wall Street firms, banks, and financial-data companies. Mr. Lehman is the founder of BehavioralFinance.com and produces the Behavioral Finance Symposium, an annual educational event for financial professionals held in San Francisco.